Sunny skies and an increasingly southerly flow will help temperatures moderate across the Finger Lakes. High pressure has moved southeast of the Finger Lakes, which will help temperatures become more tolerable. Sunny skies will once again grace the Finger Lakes on Wednesday. Temperatures will be warmer than on Tuesday, with most areas reaching well into the 30s. The sun, combined with an increasingly southerly flow, will be responsible for the rise in temperature. It will still get rather cold tonight, though not nearly as cold as the recent nights. Lows overnight will range from the teens in the typically colder valleys to the mid 20s near the lakes. Some clouds will drift in for partly cloudy skies. Skies will remain partly cloudy for Thursday and Friday. Temperatures will get a bit warmer, with highs both days around 40 degrees. Overnight temperatures Thursday night will be similar to Wednesday night, with upper teens and 20s. Friday night, the weather will start to get a bit more active. 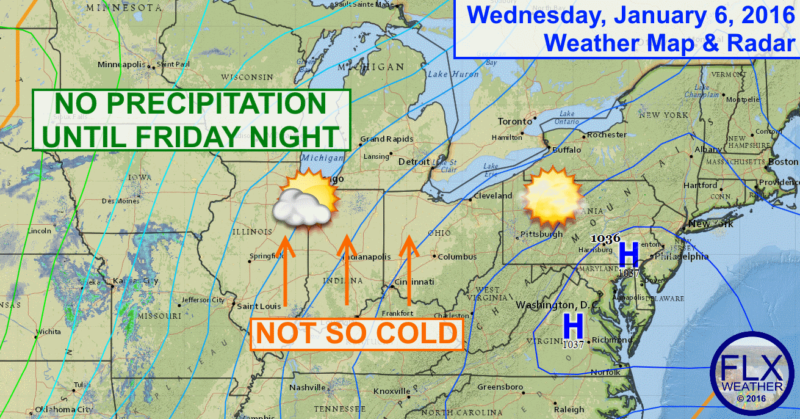 A push of warmer air will cause some precipitation to break out. At this time, the precipitation looks scattered and light. However, it may fall as a bit of freezing rain before temperatures rise above freezing early Saturday morning. Showers will be on and off Saturday as temperatures rise into the 40s. A strong storm system will impact the region on Sunday. At this time, it looks like it will be a warm, wet and windy storm, but there are still some uncertainties to work out.